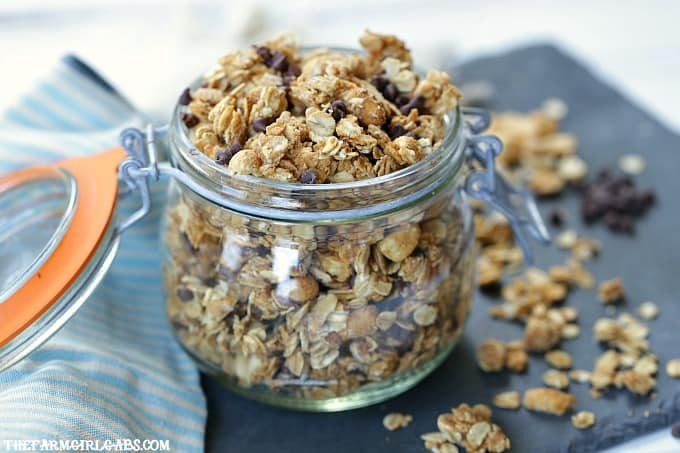 For breakfast or a quick snack, this easy Peanut Butter Chocolate Chip Granola recipe will have everyone begging for more! Here’s a fun fact! I love making my own granola. It’s delicious, much more inexpensive than buying it in the grocery store and the flavor combinations are endless. This Peanut Butter Chocolate Chip Granola is by far our favorite though. I actually am surprised it took me this long to share the recipe with you (my bad). The last batch I made was devoured by Anthony in a matter of two days. It’s pretty cool how simple and wholesome ingredients, like oats, peanut butter, and honey, can work together. And of course, there is the peanut butter and chocolate factor. As we all know, they are a match made in heaven. I have found that over the years I like crunchy food. I guess it’s a wacky texture thing. Once this granola is baked in the oven, the oats, honey, and brown sugar create the perfect crunch. The family likes to eat it as is but I also like to enjoy it in yogurt or as an ice cream topping. The beauty of this recipe is not only the simple ingredients but the fact that it can be ready in only 20 minutes. Nothing store bought can ever compare to the taste of homemade granola. If you are not a fan of the ingredients I used, put your own spin on it by adding different nuts, dried fruits , nut butter, seeds or coconut. I guess you can say this recipe is pretty versatile. I like to think of it as a one-bowl wonder too! Mix all the ingredients together in a large bowl . Spread evenly on a baking sheet and BAM! you got yourself a pretty delicious snack the whole family will enjoy. You can store your Peanut Butter Chocolate Chip Granola in an air-tight food storage container , fancy glass jar or food storage bag – whichever way floats your boat. It will keep for several weeks if stored properly, that is if it is not gobbled up sooner. In a large microwavable bowl, add honey, peanut butter, and brown sugar. Microwave for 30 seconds. Remove and add oats, vanilla, and nuts. Mix well. Spread mixture on baking sheet. Sprinkle chocolate chips over top. Bake 18-20 minutes until golden. Cool and store in a food storage container for up to one month. You can save this recipe for later by pinning the image below to your favorite Pinterest board.